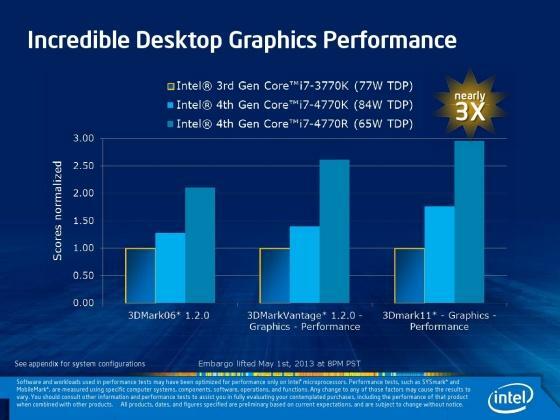 Intel is hinting that integrated graphics performance may be Haswell’s most compelling feature. In information revealed today, the company is promising that its next-generation integrated graphics processor will be up to three times quicker than that shipped in outgoing Intel Core processors. But there is a catch. In previous Core products, there were only two tiers of IGP and the slower part was found only in some low-end desktop processors. Intel has revealed it will abandon that strategy for a three-tier approach. Ultrabooks will receive HD 5000, laptops with 28-watt processors will receive an IGP called Iris, and high-end laptops, plus most desktops, will use an even quicker version called Iris Pro. Perhaps the most interesting news, from a technical standpoint, is Intel’s reveal that Iris Pro can be paired with embedded DRAM. This is an important feature since a traditional IGP relies on system memory, which becomes a performance bottleneck. Unfortunately, the use of independent memory is optional, so not all computers with Iris Pro will offer it. All of the new parts will support DirectX 11.1, Open GL 4, and Open CL 1.2. Today’s news is both good and bad. The bad news is that anyone hoping tomorrow’s Ultrabook might provide a great IGP will be disappointed. Intel claims a 50 percent improvement, which sounds good, but isn’t enough to keep up with the pace of graphics innovation (remember, 50 percent more of a small amount makes for modest gains). But the good news is that larger laptops and desktops may indeed be great performers. If Intel’s figures are right, desktop Haswell parts will be able to tango with small video cards like Nvidia’s GT 650. Of course, claims made before release tend to be a best-case scenario, so real-world performance may lag what Intel says. We’ll have to test it for ourselves when Haswell hits the market.